The Bowtex concept is a relatively simple one, although these days there are a number of different ranges, which makes choosing the right Bowtex line just a little more complex. Bowtex tops and bottoms come with pockets for armour in the shoulder, elbow, hip and knee areas. The idea is that you can wear your Bowtex under any outer garment in the knowledge that you’ll enjoy a good degree of abrasion resistance, as well as impact protection. The Standard Bowtex pieces are made from a mix of Kevlar (55%), Protex (25%) and cotton (20%). The Kevlar delivers abrasion resistance. The Protex raises the melting point of the material so that you won’t receive burns when sliding down the road. The Protex also delivers some degree of water repellency. The cotton component is for comfort. The armour does not come as standard. Bowtex does provide its own armour, but we usually prefer to fit D30. Now, these leggings and tops do a job, but you have to understand that wearing, say, the leggings underneath a jean or some other pant is the equivalent of wearing a fully-lined protective trouser. No problem with that other than the fact that you will get pretty hot when it’s warm. In the summer, wearing Bowtex leggings can be uncomfortable. By contrast, in the winter they can deliver a useful degree of insulation. The Standard top and bottom come in yellow, but these days there’s also a less conspicuous black version. They do the same thing, but they are more expensive. The Bowtex 'Standard' two-piece combination. Available in yellow, or black.. It was in response to concerns about comfort that Bowtex introduced a range that it calls the Essential range. 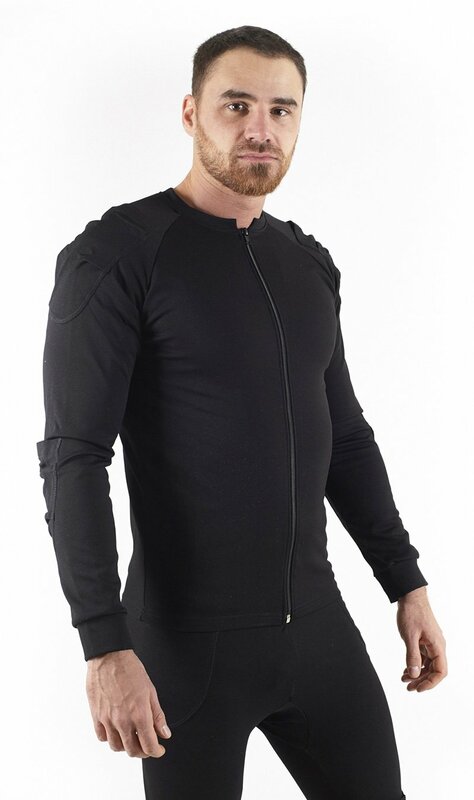 Now with the Essential garments the base layer itself is made from Elastane (83%) and Polyester (17%). This means that, on their own, neither the pant nor the shirt delivers anything by way of abrasion resistance. 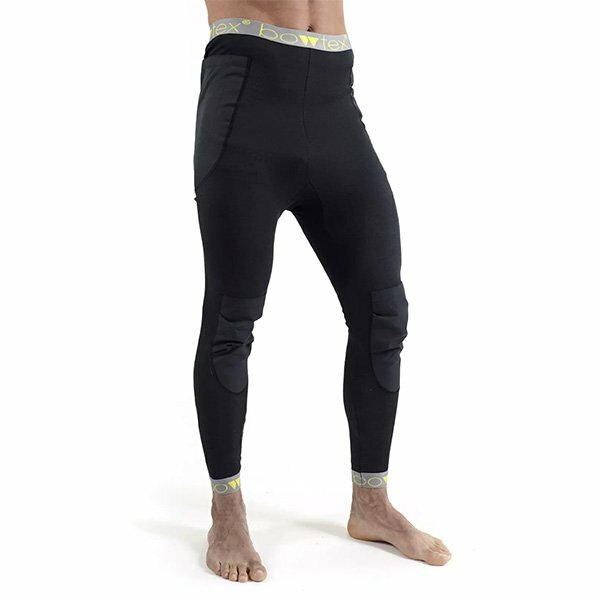 Which is why Bowtex has added Kevlar panelling in the bum area and on the knees and hips, as well as in the shoulders and elbows. 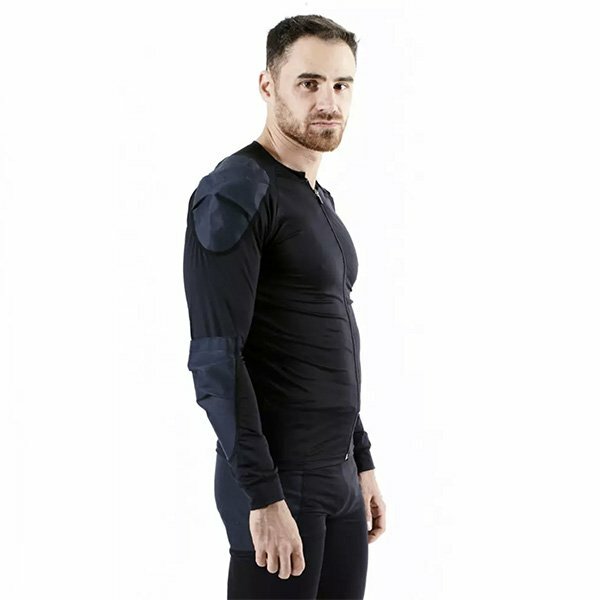 The Essential garments are lighter and easier to wear than the Standard range, but it does mean that you only get abrasion resistance in these zones. Of course, having some abrasion resistance is much better than having none and, as with the Standard range, the Essential garments will take armour. They’re going to be nicer to wear in the summer, and much more breathable, but the Standard top and bottom will deliver better and more comprehensive protection. The Essential range comes in black only. The Bowtex 'Essential' two-piece combination. Most recently, Bowtex has introduced a third iteration, called the Elite range, that is made with Dyneema. Now Dyneema is stronger than Kevlar. It is also nicer to wear against the skin, as it dissipates heat more effectively from the body. The composition of the top and bottom is 32% Dyneema and 68% Nylon. 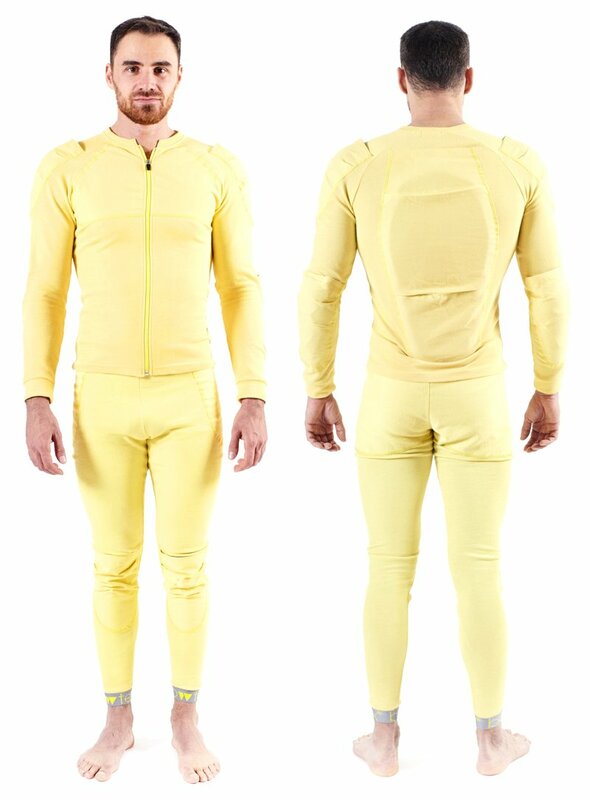 As with the standard Kevlar garments, the protection is all over, and not just in specific zones. The Elite leggings and tops take armour, and are the most abrasion-resistant products in the range. They are also the most expensive. The Bowtex 'Elite' two-piece combination. So, there you have it. 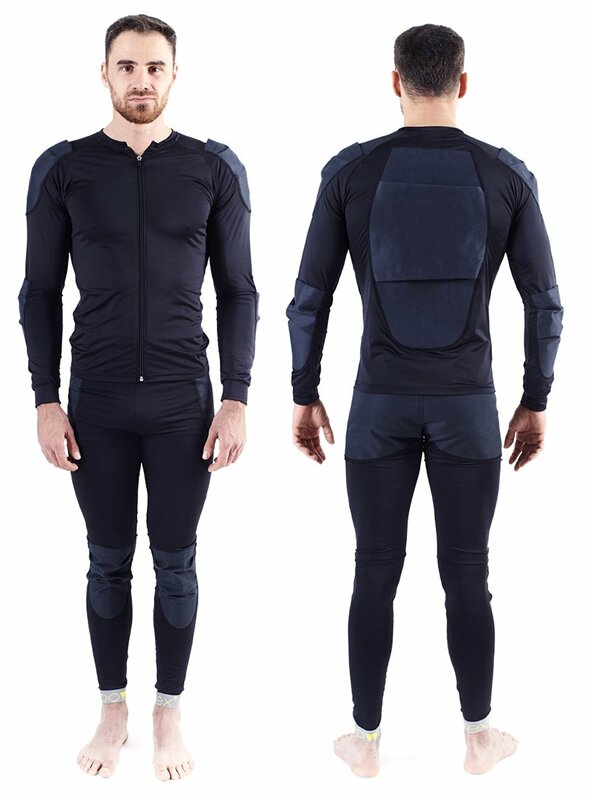 We were not always great fans of Bowtex, because it seemed to us that it added extra complexity, but of course it’s a godsend if you want to be able to wear lots of different jackets and pants on the bike. 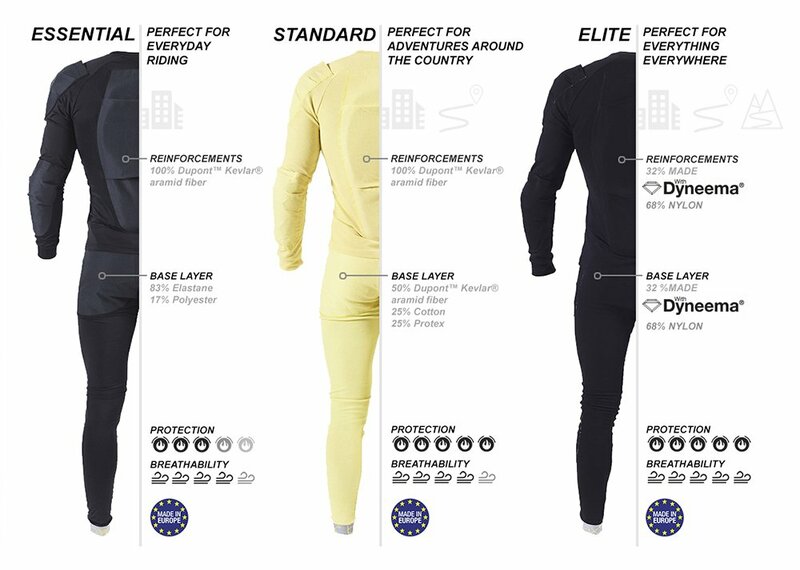 If you want the ultimate levels of protection, go for the Elite products that are made with Dyneema. 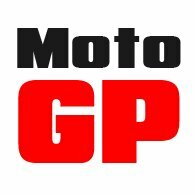 If your riding is more urban oriented, where slightly lower levels of protection are acceptable, go for the Essential range; and especially so if much of your riding is in the summer. The Standard Kevlar range sits somewhere between the two other lines. Not quite as protective as the Elite Dyneema products. And not quite so easy to wear and comfortable as the Essential top and bottom.